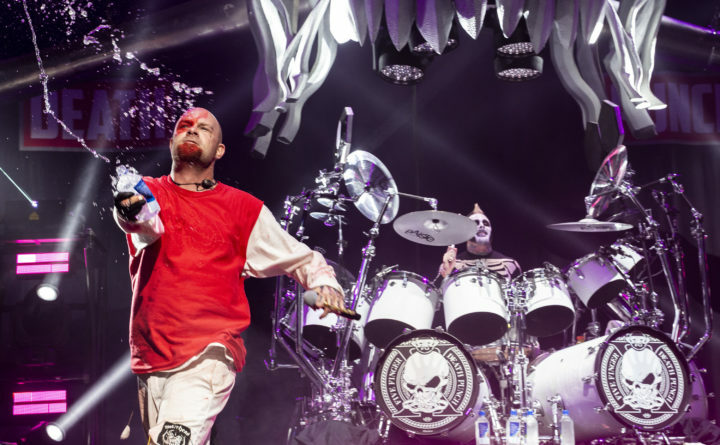 The American heavy metal rock band Five Finger Death Punch with lead vocalist Ivan Moody and drummer Jeremy Spencer performs at the Xfinity Center, Saturday, Aug. 18, 2018, in Mansfield, Massachusetts. The Impact Festival joins other previously announced concerts at the Darling’s Waterfront Pavilion, including Ozzy Osbourne and Megadeth on June 15, Phish on June 25 and 26, Florida Georgia Line on July 18, and Train and the Goo Goo Dolls on July 30. More concert announcements will be coming in the next few weeks.